"I was president of Egypt"
This may seem rather strange, but I own a small collection of 1950s-era portraits of Muhammad Naguib, Egypt's first president (1952-1954.) Few people remember him, and in fact most assume that Gamal Abdel Nasser was Egypt's first president. 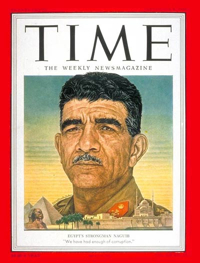 In fact, Nasser was the strongman behind the coup and Naguib, who had been the head of the army under the monarchy, took on the post to assure a smooth transition. Nasser ended up overthrowing him and jailing him (in a psychiatric hospital) and then assumed the presidency himself. I don't know enough about Naguib to say what would have happened if he had consolidated power at the expense of Nasser, but I get the feeling it would have been a less transformative experience for Egypt (particularly for the social mobility that took place under Nasser, bringing a lot of poor people out of their misery) and also a less totalitarian experience. Naguib resembles those weak Arab military strongmen seen in Syria and Iraq in the 1950s -- most of them coming out of the old system and with their "class interests" associated with the bourgeoisie rather than the petty middle class. Some say Naguib was committed to restoring multi-party democracy after the 1952 coup and introducing a more democratic constitution than Egypt has ever had since. Nasser, who craved power more than anything else (but, in contrast to his successors, seems to have not been corrupt, even if tolerated corruption around him), would not stand for it. When he was released (in 1970, I think) from his house arrest, Naguib wrote a book titled "I was president of Egypt." I always thought that title was full of pathos, as if Naguib had to remind people, in the context of Nasser's megalomaniac personality cult, that he had been president. What makes me write all of this is this cool cover from Time magazine posted on Fustat.